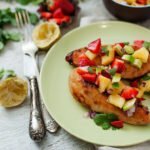 This BBQ grilled honey lime chicken recipe is the perfect summer BBQ dish. 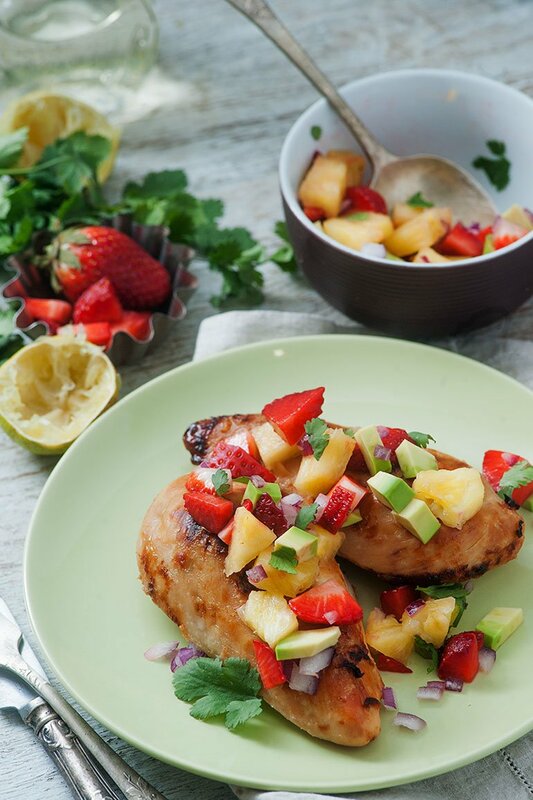 Topped with pineapple and avocado salsa, it’s refreshing, fruity, and packed full of flavor. With BBQ season fast approaching, it’s great to have a delicious grill recipe that’s a) not red meat, and b) not caked in fat or sugar. Chicken is a really versatile meat, and this recipe is proof of just that. It’s crisp, it’s refreshing, and it’s fruity. Not all things that you would normally associate with BBQ. Every bite is rammed with flavor, and is a great dish to have in your repertoire for summer. 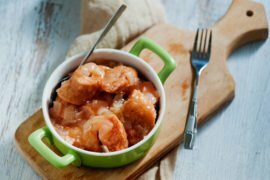 I first discovered this recipe via Fitness Food Diva, and it’s been one of my go-to recipes for a little while now. Just like Shannon, I eat my fair share of chicken, and this is a great way to mix things up a little and add a lot more zing and punch to your plate. I’m not always sold on fruit taking its place on a dinner plate. Something about it just feels… wrong. However, that’s not the case at all for this dish. It complements the white meat and spices perfectly. 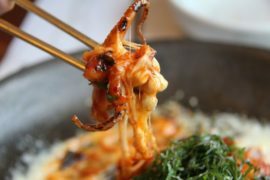 For a lazy cook like me, this recipe is particularly great because it’s so quick and easy to put together. Besides the marinating, the most time-consuming part is waiting for your grill to heat up! 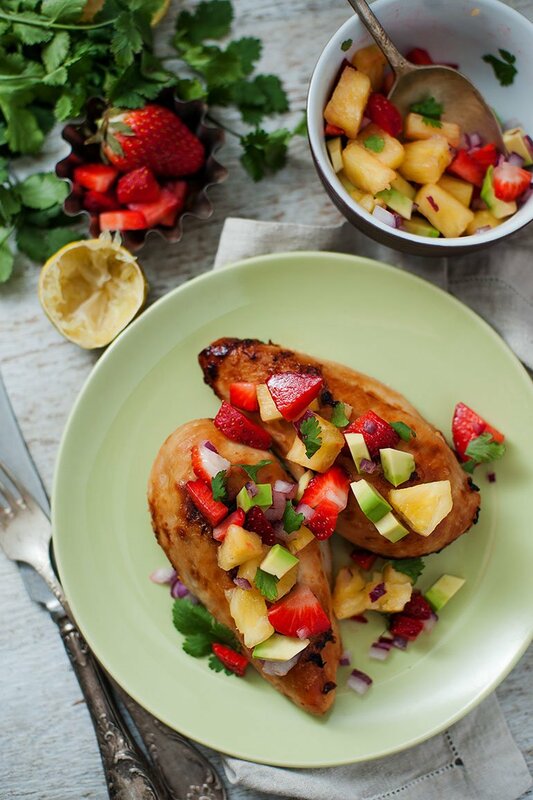 It has a beautiful honey and lime marinade that adds as the perfect sweet counter to the fruit in the salsa. It moistens the chicken beautiful, and helps ensure that it doesn’t dry out when thrown on the grill. The marinade is key in this recipe, so bear in mind that you will need at least 3 hours to let the chicken marinate in the refrigerator. You might even want to do this overnight. If you don’t have an outdoor grill, then you can easily use the grill feature on your oven. However if you are using a BBQ grill, remember to oil your grill grates before igniting or heating up the grill. Keep internal temperature in mind. When it comes to grilling, it’s very easy to char the outside of your meat while leaving the inside still raw and unsafe to eat. I recommend getting a good grill thermometer. They’re great value for money, and will change the way you use your BBQ grill. Start by making the marinade. Add the lime juice, olive oil, cilantro, honey, and salt to a large bowl. Combine well. Add the chicken breasts to a ziploc bag. You might need to split them between two bags. Pour the marinade over the chicken. Seal bags and transfer to refrigerator. Allow to marinate for at least 3 hours, or overnight. Once chicken is ready, preheat your grill to medium-high. Place the chicken breasts on the grill and cook for about 8 minutes on each side, or until charred and internal temperature reaches 165°F/72°C. While the chicken in grilling, prepare the salsa. Add pineapple, strawberries, avocado, red onion, lime juice, and cilantro. Stir together well and add salt and pepper. 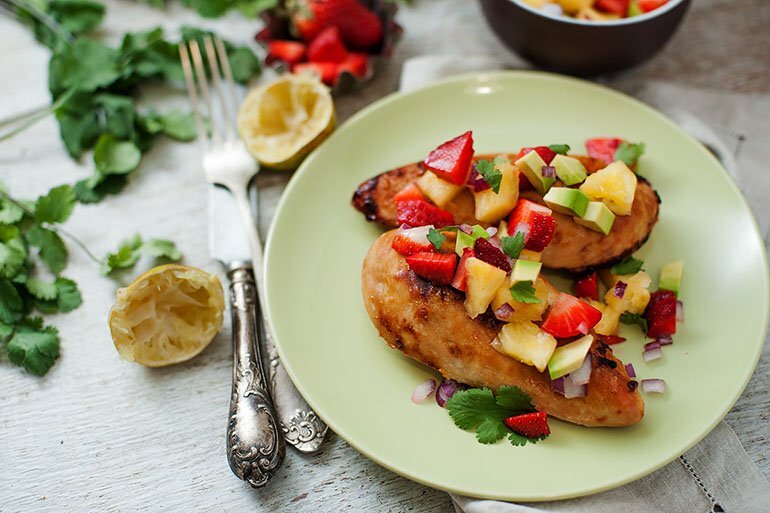 Once the chicken is cooked, transfer to plates and serve pineapple salsa on top.